Despite some self-inflicted problems, such as those highlighted by the Leveson inquiry in the United Kingdom five years ago, news media and responsible journalism remain of critical importance to democracy. 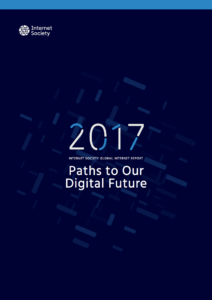 The Internet Society’s 2017 Global Internet Report reveals how media is intricately entwined with society and it will become more so as more people and services go online. The Internet has grown from 400 million users in 2000 to 3.5 billion users today and as access expands further the media have countless new opportunities to increase their reach and better inform their audiences. But “going online” also introduces unique challenges for the media. In the next five to seven years, the Internet will continue to fundamentally impact society and the media. According to Reporters without Borders, media freedom violations – impacting particularly anonymity, privacy and free expression – have increased by 14 percent in the past five years, for example. As the Internet and news media become more converged, it is relatively easy to identify examples of measures restricting media freedoms under the guise of the conveniently vague ‘national’ or ‘public’ interest. Some governments have, for example, taken to restricting access to the Internet entirely or partially for their citizens, particularly during times of elections or potential political upheaval. 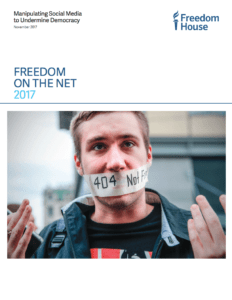 According to 2017’s Freedom on the Net Report, 19 of the 65 countries tracked had experienced at least one Internet shutdown during the past year. These so-called “Internet shutdowns” are generally done by governments in cooperation with the private sector (e.g. telecommunications companies) under the guise of ensuring national security or maintaining public order. But it also limits the media’s ability to report on matters of crucial importance to the public interest when it matters most. Another example is the control of information through fake news stories, bot accounts and comments, and message framing and bias. Governments in 30 of the 65 countries monitored in the aforesaid Freedom on the Net report tried to control online discussions using such measures. Besides other concerns about misleading news, this phenomenon has also bred distrust in the media as a whole, undermining news business. At a time when information online proliferates but audiences’ attention spans stay the same, it therefore becomes increasingly difficult for credible news sources to survive in an attention economy. A third example is governments’ tendency to clamp down on encryption measures designed to protect information, journalists and even their sources. In Brazil, for example, four different court orders have temporarily restricted access to WhatsApp, a messenger service provided by Facebook which provides end-to-end communication encryption. The service was blocked because their de facto end-to-end encryption does not enable them to respond to law enforcement requests, even if they had wanted to. This trend isn’t limited to platforms. News publications, too, have felt the brunt of governmental force when covering stories while using encryption services. In 2015, three Vice staff members in Turkey were charged with deliberately aiding an armed organization because one of the men was using an encryption system which is sometimes also used by the Islamic State of Iraq and the Levant (ISIL), for instance. We need to ensure protective measures such as the right to encryption become more common, more accepted and more protected. The Internet Society is starting that journey with security toolkits and guidance on how and why to encrypt from organisations like the Electronic Frontier Foundation (EFF) and the Committee to Protect Journalists. Meanwhile, the Internet Engineering Task Force is working to make encryption common practice for domain name systems queries and emails. These measures on their own may not be enough to protect the future of ethical journalism though. As stewards of the Internet, we must continue to band together with all stakeholders to find innovative ways to protect our watchdogs and their sources. This article originally appeared on Ethical Journalism Network.